As is true across the land, gays and lesbians in the State of Washington have faced - and continue to face - a long uphill struggle to gain the basic civil rights most Americans take for granted. For 20 years, proponents in the Washington state legislature have introduced legislation which would ensure non-discrimination in such areas as employment, housing, public accommodations, credit, and services. For 20 years these bills have been defeated, most frequently killed in committee. In the 1990s, the battle for basic rights moved beyond the legislative chambers and into the arena of community based grassroots politics. Opponents of gay and lesbian rights "fired the first shot" in 1993 by putting forward harshly-worded anti-gay initiatives patterned after Oregon's infamous Measure 9. In response to that initiative, supporters of gay and lesbian civil rights founded Hands Off Washington (HOW) as a leading statewide advocacy group. When it was formed in 1993, HOW's first task was to rally volunteers and persuade voters to quash anti-gay initiatives in Washington state. The group was successful in raising the money and political awareness necessary to defeat the initiatives quite soundly. Thanks largely to HOW's statewide voter education efforts, none of the four anti-gay initiatives proposed since 1993 received the signatures necessary to be placed on the ballot. Filmmaker Liz Latham produced and directed a 56-minute documentary film to tell the story of Hands Off Washington and, more broadly, the story of the struggle for gay and lesbian civil rights in Washington state. The documentary was shot in high 8-mm broadcast-quality videotape, and the final version was edited in the Beta format using Media 100 software. In 1997, Hands Off Washington took a proactive approach by sponsoring an initiative to protect employment rights of gays and lesbians. Currently, Washington state law prohibits employers from discriminating against people based on their gender, religious background, race, or handicap; sexual orientation was not included, as many people assumed. Initiative 677 would have strengthened the law so that employers could not discriminate against people based on their sexual orientation or their perceived sexual orientation. With HOW's leadership, more than 230,000 signatures were collected to support a vote on the initiative. Initiative 677 appeared on the statewide ballot on November 4, 1997. The initiative was defeated, with a vote proportioned at about 40-60% in most counties. Hands Off Washington's efforts brought issues of gay and lesbian civil rights to the forefront of the public agenda. The group's efforts opened up the dialogue around the state, most dramatically in suburban and rural areas that had not previously addressed these issues in a thoughtful and comprehensive way. The board of directors of Hands Off Washington was racially and regionally diverse. 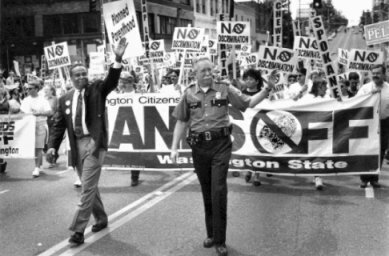 In the late 90s, Hands Off Washington became Equality Washington and served as a national role model in statewide community grassroots organizing. The organization maintained a trained speakers bureau, and used information tables, a prominent bumper sticker and lapel button campaign, and written materials that informed and persuaded the public. HOW was also active on behalf of affirmative action and anti-immigration issues in the state. The lobbying group for the Gay, Lesbian, Bisexual and Transgendered communities in Washington state is now called The Fairness Lobby. Seattle has Washington state's largest and most concentrated gay and lesbian population, and the city is the center of Hands Off Washington's state office and activities. Since Initiative 677 was statewide, however, HOW was active in suburban and rural areas as well. HOW's presentation of the issues to suburban and rural audiences, which tend to be less familiar with civil rights issues and more hostile toward gays and lesbians, is an important dramatic element within the film. The film presents materials in an integrated style most frequently associated, in the public mind, with filmmaker Ken Burn. Clips from interviews conducted specifically for this film are mixed with still photos, headlines, and footage from events, rallies, voter registration initiatives, demonstrations and counter-demonstrations. Narration by Ken Vincent (KUOW radio personality) threads the images together and provides continuity throughout the film. A song written by producer/director Liz Latham and performed and arranged by Patrinell Wright and Seattle's Total Experience Gospel Choir is woven throughout the film. The story is told chronologically. Much of the latter half of the film follows Hands Off Washington's campaign on behalf of the 1997 ballot initiative, which the organization drafted and promoted. Film from pro-initiative events, pro- and anti-initiative press conferences, interactions with voters, initiative rallies, and other events follow the build-up to Election Day. The film includes Election Day itself, with election night footage, commentary from lesbian and gay activists who worked to promote the initiative, the negative election results, and the immediate election aftermath. In addition to filming Hands Off Washington meetings, rallies, and events, the production team shot more than 60 hours of interviews with leading proponents of gay and lesbian civil rights. Among the Washingtonians interviewed or videotaped were HOW Executive Director Jan Bianchi, former Washington Governor Mike Lowry, Seattle Mayor Norm Rice, and Washington Secretary of State Ralph Munro. National figures interviewed or videotaped for this documentary included retired National Guard Colonel Margarethe Cammermeyer. Tracking the campaigns for and against Washington state's Initiative 677 dominates the second half of the film. This initiative had historical importance because it represented the first time a state's citizens had the opportunity to vote on an affirmative gay-rights proposition. A statewide initiative process was used for the first time to expand gay and lesbian civil rights, rather than to restrict them. In this context, Hands Off Washington and other pro-rights groups could go on the offensive, rather than having to defend civil rights that are under attack. The decision to put forward an affirmative ballot measure was a difficult one for Hands Off Washington, and remains controversial throughout Washington's gay and lesbian community. Proponents believe that, after two decades of unsuccessful attempts to persuade the state legislature to extend basic civil rights protections to gays and lesbians, a ballot issue was the only alternative. However, many in the gay community are troubled by the notion that basic civil rights of a minority population can be put to a public majority vote, and worry about backlash effects in this and other states. The discussions of this issue within the gay community and the broader community have been intense. By depicting this very divisive issue through the statements and action of people with diverse points of view, the film dispels the na�ve but widely held notion that the gay and lesbian community is a monolithic political entity. The campaign for Initiative 677, as well as HOW's effectiveness in rural communities, could serve as models for organizations in other states which use the initiative process. Film documentation of the campaign's success will both educate and inspire pro-rights activists in other states. To serve as an educational tool for political science students and teachers at the high school, undergraduate and graduate levels who are interested in the topic of statewide grassroots organizing and effectively mobilizing state citizens into action on proposed initiatives or legislation. Decision-makers in politics and the media, educators, and civil rights activists are among the primary target audience groups. In addition, those who view and evaluate documentary films - for example, at film festivals - are an important audience. This documentary includes scenes from press conferences held by an opposition group, N.O.P.E. - No Official Preferential Employment - which argued that Initiative 677 would result not in equal rights, but in special rights for lesbians and gays. N.O.P.E. brought the niece of the late Reverend Dr. Martin Luther King, Jr., Alveeta King, to Seattle. Surrounded by a group of Pentecostal and evangelical African-American ministers many of whom offer "counseling" to change sexual orientation, Ms. King gave a press conference. She argued that, unlike race or ethnicity, sexual orientation is not an immutable characteristic, but a choice. The application of the term "civil rights", she suggested, insults the people who worked and died for the African-American Civil Rights Movement in which her uncle is a prominent and beloved figure. Liz Latham is the film's producer and director. Latham has produced a short video on the same subject; entitled Heroes Are Everywhere, for Hands Off Washington's annual breakfast in 1996. She was executive director, producer, and host for the cable television series Seattle Commons- It's a Park, and produced a 20-minute video on another local land use issue. Latham has also programmed a weekly television series for the Seattle Public Schools Instructional Broadcast Center. Latham has also worked for the acclaimed Seattle Weekly. A former legislative aide to a King County Councilmember, Latham brings extraordinary organizational, management, and political skills to this project. An accomplished pianist, she holds a B.S. in Radio, Television, and Film from the University of Maryland. Latham's past community/political activities include a term as Board President of Seattle's Lesbian Resource Center, Commissioner with the Seattle Commission for Lesbians and Gays. Latham has been a campaign worker for Seattle City Councilmember Jan Drago, Seattle Mayor Norm Rice, and the Past King County Executive campaign of present Washington State Governor Gary Locke. She is also a past board member of Hands Off Washington. Zola Mumford is the film's associate producer. Mumford is the founder/director of Gumbo Media/Gumbo Film Group, which provides production assistance for films, videos, television productions, and web sites. Her recent film credits include Take This Heart (1997) for KCTS/9, Seattle's PBS affiliate; Dear Little Sweet Thang 'Nita (1995), produced with a Seattle Arts Commission Artists' Program Award; a live-action/animation film short produced under a second Seattle Arts Commission Artists' Program Award, to be completed in 1998; and a 1997 performance video of Afro-Brazilian dance, music, and Capoeira (martial arts). She holds a B.A. in Communications, with a concentration in community media, from Antioch College. She is active in Seattle's African-American community. Dodi Favors, Editor - Dodi started as an intern on our project from The Art Institute of Seattle. She later taught us that she could do more and became the film's editor and assistant producer. The production team has benefited greatly from Dodi's dedication, energy and input. Dodi is now serving a six-year term in the United States Navy. Powers/Espinoza Designs, Seattle, WA. - Bill Powers and Lino Espinoza designed the film's poster and mailing card. Bill Powers, with his 20 years experience in broadcast television was the film's Associate Editor and was responsible for the final script and look of this documentary. We couldn't have made this film without the tireless dedication of Bill Powers. The Pelican Bay Foundation was the fiscal agent for this film. Established in 1975, The Pelican Bay Foundation is an artist cooperative which supports and sponsors arts programs, education programs in the arts, and performances and films. The Pelican Bay Foundation supports equal rights for all, without preferences based upon racial/ethnic background, gender, economic status, sexual orientation, religion, physical ability or disability, or marital status. Pelican Bay believes that the documentary can foster productive and positive public dialogue regarding the issues of fair employment law, non-discrimination, civil rights, gay & lesbian rights, and political awareness. "We're Here To Stay" premiered at Seattle's historic Paramount Theatre on May 8, 1998. The film also appeared in Seattle's Gay and Lesbian Film festival in November 1998. The producer soley distributes the film to the university political science curriculum, public libraries and video stores nationally. The film received a Three-Star rating in the December 1998 issue of Video Librarian and is recommended for university and public library social studies collections. The film is available for purchase soley through Lizard Productions. Copyright 1998. All public performance rights reserved by Liz Latham and Lizard Productions.